DURHAM, N.C. - The International League scored four runs in the first two innings en route to a 7-3 win over the Pacific Coast League in front of 10,274 fans Wednesday night at Durham Bulls Athletic Park. In the 27th annual Triple-A All-Star Game, Buffalo's Liam Hendriks tossed two scoreless innings to kick off the game for the IL allowing just one hit and striking out four. Of the right-hander's 25 pitches, 19 went for strikes en route to the victory and MiLB.com Top Star honors for the IL. Offensively the IL got to PCL starter Elih Villanueva of New Orleans early, as Durham's Wilson Betemit drove in two with a single in the first inning. In the second frame, Syracuse's Jhonatan Solano crushed a two-run homer over the Blue Monster in left field to double the IL's lead at 4-0. The visitors got a run back in the sixth frame when Albuquerque's Joc Pederson launched a solo homer to right, but the IL came back with three runs in the bottom of the frame as Felix Perez of Louisville drove in two with a triple before he scored himself on a double by Syracuse's Steven Souza. The PCL scored a run in both the eighth and ninth frames, but couldn't muster a comeback as the IL was victorious for the ninth time in the past 12 years. 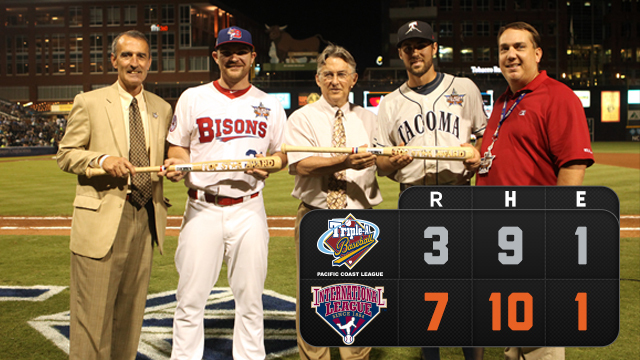 With the win, the International League earned home field advantage in the 2014 Triple-A National Championship Game. Tacoma's Chris Taylor earned MiLB.com Top Star honors for the PCL, going 3-for-4 with two doubles. Jose Pirela of Scranton/Wilkes-Barre tallied a pair of hits, while Norfolk's Ivan De Jesus was the only other player to register a multi-hit game. Of the four Durham Bulls represented, Betemit went 1-for-4 while Mikie Mahtook finished 0-for-4. Southpaw Mike Montgomery pitched a perfect third inning and right-hander Merrill Kelly recorded the game's final out. The Bulls return to action Thursday when they kick off a four-game set on the road against the Gwinnett Braves. First pitch is set for 6:35 p.m. at Coolray Field.